In the comic "Hors-La-Loi" ("The Outlaws") the probably most popular villains in the Lucky Luke series were introduced - the Daltons! However, in this story the Daltons are not the famous brothers Joe, Jack, WIlliam and Averell but their cousins Emmett, Bill, Grant and Bob. These are based on their historical idols and are unfortunately destined to die during their first appearance. 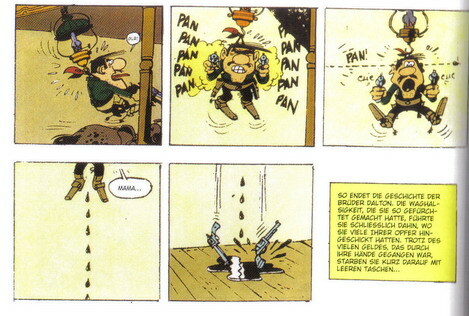 For the album version the comic, which had been released in the magazine Spirou for the first time, was altered on the last page. 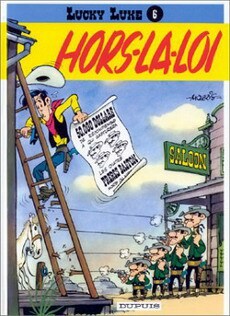 The publishing company Dupuis asked Morris to make the ending, in which Lucky Luke kills Bob Dalton with a headshot, less violent. This softened version was used as model for all reprints of the album version, only the collector's edition 1951-1954 features both endings. In the first picture we see the probably most brutal scene in the whole series - Bob Dalton gets shot in the head by Lucky Luke. He then calls out for his mother and dies fast and relatively gory! The changed version can be seen in the second picture. 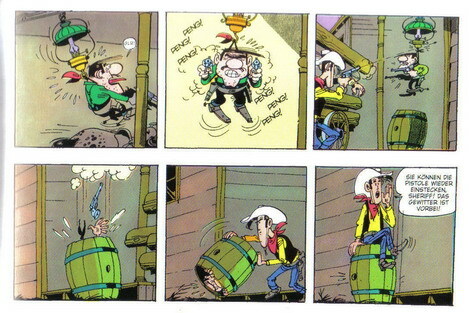 In order not to taint the funny adventures of Lucky Luke with too much violence Dupuis asked Morris to replace the original ending with this one.